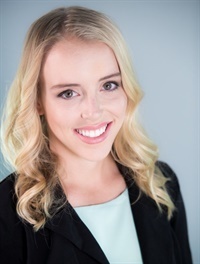 Caitlin Crommett is a recent graduate of the University of Notre Dame, and a speaker on generations in the workplace with a specific focus on Millennials. Her interest in generations began at age 15, when she started a foundation called DreamCatchers, which serves to fulfill the final Dreams of hospice patients, those with 6 months or less to live. The chapters are run by high school and college-age students, who in turn fulfill Dreams of typically-elderly hospice patients, a connection between generations not made very often in today's world. This sparked her passion for facilitating greater connection and communication between all generations, in the workplace and in the world. Crommett published a book in 2016 called How to Attract Millennials to Your Workplace: And Actually Keep Us!, focusing on new techniques and strategies for engaging Millennial employees and volunteers, and has been a guest writer and “generational expert” on several websites and blogs. Crommett has spoken across the country spreading the DreamCatchers mission and more recently on generations in the workplace, with the hopes of creating a more connected world.